The show performance of alpacas fully or part owned by Ambersun Alpacas has been unrivalled in Australia. Ambersun Alpacas has been highly successful in its show performance since 1995. Ambersun Alpacas experienced its first taste of supremacy in 1995, when "Ambersun Remington", a solid black male, won Supreme Champion in South Australia's most prestigious show, the Royal Adelaide Show. In a show career spanning over ten years, Ambersun Alpacas has won more than 50 Supreme Championships for alpacas and fleece, and over 600 Championship and Reserve Championship ribbons. Amongst its repertoire of Supreme Champion Males are Jolimont Warrior, Peruvian Auzengate, Fine Choice Peruvian Ultimo and Whitehorn Ranch Masquerade. With the exception of Auzengate (who sadly passed away in 2006) each of these award winning males now stand at stud at Ambersun Alpacas. Their progeny command the respect of judges across Australia and have continued with this winning tradition. In addition, other Champion males of Ambersun Alpacas have been sold for breeding across Australia and internationally. These males include Ambersun Sebastian (New Zealand), Ambersun Montgomery (NSW, Australia), Ambersun Poseidon (NSW, Australia), Ambersun Verdello (UK), Ambersun Gallipoli (NSW, Australia), Ambersun Trinity (Victoria, Australia), Ambersun Toledo (New Zealand), Ambersun Romanza (NSW, Australia), Ambersun Amaretto (New Zealand), Ambersun Soprano (Ireland), Ambersun Peruvian High Dancer (Ireland) and Ambersun Alamo (UK). The international demand for Ambersun bloodlines is strong. Many of the breeding females of Ambersun Alpacas are also in the Australian "Hall of Fame", winning Supreme Championships in Shows across Australia. The most highly awarded females of the Ambersun herd include Ambersun Salvadora (11 Championships), Ambersun Clancy (5 Championships), Andamooka Serenity (4 Championships), Ambersun Serena (3 Championships), Ambersun Denali (3 Championships), Fine Choice Delaney (7 Championships) Ambersun Prelude (3 Championships), Andamooka Laurena (3 Championships) , Ambersun Prima Donna (5 Championships) Ambersun Gold (21 Championships), Ambersun Marguerita (9 championships), Ambersun Primera (3 Championships), Ambersun Solitaire (3 championships), Andamooka Savannah (3 championships), Andamooka Estancia (11 Championships), Ambersun Amazing Grace (3 Championships), Andamooka Sarah (12 Championships) and Ambersun Palomina (10 Championships). The majority of these females now form the ‘Plantel' Collection of Ambersun Alpacas, along with their elite quality females imported from Peru. The Australian National Classic is the showcase event for the Australian Alpaca Industry. It is held once a year and attracts over 500 exhibits from across Australia. 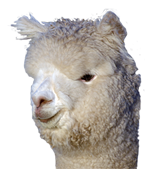 In 2003, Ambersun Alpacas was the most successful exhibiting stud at the National Show, with alpacas partly or fully owned by Ambersun Alpacas winning five championships and one reserve championship (of a total of 10 huacaya sections). Ambersun Alpacas also sold the highest priced alpaca at the National Auction at the same event, a solid white male named Ambersun Romanza, selling for $83,000 (+ taxes). The superiority of Jolimont Warrior has been confirmed through the results of the Australian National Shows, with this bloodline winning the highest possible award for Australia for three consecutive years.